4 makuuhuonetta, 3 kylpy Luxury 2600 m², 2-750 m² / ft kannet, poreallas, saunat. Olohuone, perhehuone, Internet / kaapeli, (2) poreallas, höyrysauna suihku, Premium huonekalut, pesutupa, ulkokylpy. Luxury Incline / Tyrolian Village Mountain Home pisteen näkymät järvelle ja suoraan vastapäätä Diamond Peak Ski Resort. 2 master sviittiä ja 2 kansiin suoraan järvelle ja rinteestä näkemyksiä. Ulkoporeallas. Snow huone sisäänkäynnistä mukava, kätevä suuri huone ja Master Suite ylimmässä kerroksessa. Kaikki mitä haluatte ja loma-vuoren kotiin perheesi. Olitpa hiihtää tai mässäillä tämä Mountain Retreat rentouttaa vauhtia elämään ja näkymät innostaa sinua. Päivittäinen siivouspalvelu saatavilla. Great place, great views! Perfect for two families. Loved the steam showers, kids loved the jacuzzi. Very close to Diamond Peak skiing, which is a great ski resort and wasn't crowded even during a 3 day weekend! Perfect family house perched on an amazing view! We checked in on a cold snowy night, and were welcomed to a great house. This place is kept to a high standard of cleanliness and is well kept. Kitchen is fully stocked with great dishes, utensils and appliances. All the bathrooms were great plenty of towels, and the steam showers and jacuzzi tubs added a level of comfort. Bedrooms were spacious with very nice mattresses, very comfortable. All in all the house is great I'd stay here again in a heartbeat. We (four family members) stayed for five nights for our Christmas vacation with my senior parents (86 y.o. ), and my brother and his family (four members). My older parents were perfectly situated on the first floor, my brother and his family and I spread out on the second and third floor. The separate family room down there was very nice to have for our kids to hang out when they woke up earlier than everyone else. Things I appreciate most: how well equipped the kitchen area is (plenty of high quality pots/pans and appliances), the steam showers, and the amazing view of the mountains and lake. Seating was comfortable and we enjoyed the Christmas decorations. More than enough bath towels (nice!). Things I recommend being prepared for; we found the hill to get up to the house a bit challenging because the roads (*although plowed) remained icy. (Not sure why they don't use sad/dirt/salt to help melt and provide traction?) bring your own toilet paper (we ran out real quick), garbage overflow (no outdoor bins at the house, you must drive your garbage to a dumpster nearby), and communication with the owner was a bit difficult (upon asking for more information; slow response time and no reply to my texts (3)). Overall I give them 5 stars because it was the perfect house for us and very accommodating for all our needs which far outweighs the things I would improve upon. Hubby still talks about that view!!! This review is long overdue. We rented this house a few years ago. The owner was very easy to deal with. The house was comfortable and cozy for our party of eight. The view is spectacular. Very easy close to Diamond Peak (less than a 5 minute drive). The kitchen was well stocked with proper dishes and utensils. We had a great time. Would definitely consider going back! This is a lovely home with views of Diamond Peak and the Lake. It's well furnished and comfortable. There is plenty of parking and the kitchen is great to cook in. The wrap around deck was a great place for a morning coffee and to see the views. On the downside, (a) the dryer did not work and the options given to us were to wait for a repairman for a 4 hour window on New Year’s Eve (instead of skiing) or go to a Laundromat. This was certainly inconvenient and not what I expected for a rental this expensive, (b) there were other items that didn't work during our stay (e.g., hot tub water was evaporated and downstairs TV didn't work), but in fairness to the Owner, I didn't raise those because I didn't want to spend my vacation waiting for repairmen for any reason, and (c) finally, a family of 4 joined us for 2 of the nights during our stay and the owner was extremely upset that I hadn't asked. I seriously didn't think it was a big deal since there were 4 of us and the house sleeps 10 to 12. In any event, he said his neighbors watched who went in and out of the house, marked their calendars on the days people and cars were there and reported everything back to the owner. It is not very comfortable to rent from someone who has neighbors reporting back every move. We are a young family, weren't loud and, by the owner's admission, left the house in great condition. We just wanted to ski and enjoy the snow. That said, it truly is a beautiful home and in a gorgeous location, but for the $7000 I spent, it just wasn't as seamless as I'd expect it to be. We had a wonderful time in this lovely chalet- photo gallery doesn't do justice to how spacious, comfortable and well appointed it is. 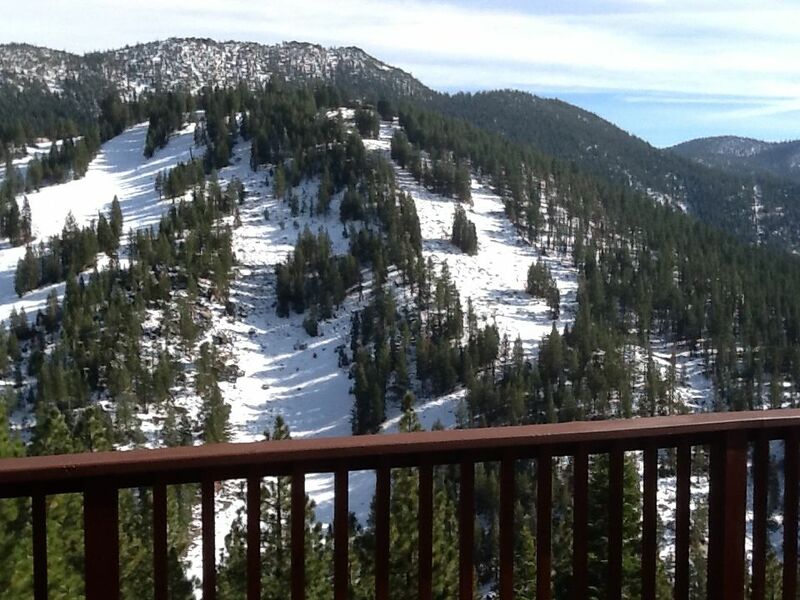 My three grandchildren took daily ski lessons at Diamond Peak, just a stone throw away. The views from all direction are magnificent, the hot tub works perfectly, the kitchen is perfectly set up for a family- we cooked dinner every night, plenty of pots and pans, utensils and dishes. Beds, bathrooms, linens are first rate. We didn't want to leave! Owner most accommodating and helpful- thank you, David! Tämä Mountain Home on määritelty sen näkemykset ja lähellä Diamond Peak Ski Resort, ylellistä mukavuutta se tarjoaa ja, se on vain minuutin päässä rannalta. Oli kesä tai talvi, on monia toimintoja nauttia. Se on täydellinen Mountain Retreat kaikkina vuodenaikoina.